Ringworm (tinea) is a common skin condition caused by infection with what’s called a dermatophyte fungus. This type of fungus can infect skin, nails and hair and is very contagious. Ringworm is a type of tinea - other common types include athlete’s foot and jock itch. The different names simply describe the area of skin that’s affected. The medical name for ringworm (tinea affecting the skin on the trunk, arms and legs) is tinea corporis. Ringworm is not caused by a worm under the skin, and is not related to worms. The name is due to the appearance of the skin lesions, which often look like a ring or a worm. Ringworm symptoms - what does ringworm look like? The main symptom of ringworm is the appearance of round patches of dry, scaly, red skin. The patches usually have a red, raised, bumpy border that looks like a ring, or worm. The patches may appear brown or grey on darker skin. The skin in the middle of the ring is usually less red and scaly and may even look like normal skin. The patches are usually very itchy. When ringworm affects the skin of the scalp it can cause patches of hair loss. Ringworm is caused by an infection with a specific type of fungus called a dermatophyte fungus. The proper medical term for ringworm is tinea corporis. Tinea corporis - ringworm - affects the body. Tinea cruris - also known as jock itch - affects the groin. Tinea pedis - also known as athlete’s foot - affects the soles of the feet. Tinea unguium affects fingernails and toenails. Tinea capitis affects the scalp, and is usually seen in children. You can catch the fungus that causes ringworm through direct contact with an infected person or animal. It’s also possible to catch it by touching contaminated objects (such as a towel or sports equipment used by someone who has ringworm) and from contact with soil. Ringworm is common. Anyone can get it, but it is most common in children, especially those living in hot and humid climates. having contact with animals, including pets. Can you catch ringworm from pets? Yes. It is possible to catch tinea from pet animals such as dogs, cats or guinea pigs. Farm animals can also pass the infection to humans. If you think your pet may have ringworm, take them to the vet. When should I seek help about ringworm? It’s always a good idea to see your doctor if you develop a new skin problem for proper diagnosis and treatment. It’s especially important to see your doctor if you have lots of patches of affected skin or the ringworm seems to be spreading. Your GP (general practitioner) will want to know how long you’ve had the skin problem and which areas are affected. Your doctor should be able to diagnose ringworm based on its appearance and your symptoms. Your doctor may want to examine the affected area with a special UV light called a Wood lamp. Ringworm-causing fungus caught from animals appears fluorescent under the Wood lamp. Your doctor may recommend a test to confirm the diagnosis, especially if you have scalp ringworm. This usually involves taking some skin scrapings or hair samples from the affected areas and sending them to a laboratory for testing. Fungal nail problems should also be tested - nail clippings can be sent for testing to confirm the fungal infection. How do you treat ringworm? Mild cases of ringworm can usually be treated by applying a topical antifungal medication to the affected area of skin to treat the fungal infection. The earlier you start treating the infection the better. People with large areas of affected skin or ringworm of the scalp may need to take antifungal medicines by mouth (tablets or capsules) to treat the infection. Fungal nail problems need special treatment. Various topical antifungal preparations (including gels, creams and sprays) are available over-the-counter at pharmacies in Australia. Terbinafine cream or gel (e.g. Lamisil Cream/DermGel), applied once or twice a day for 7-14 days, is often recommended for treating ringworm. Continue to apply the medication to the affected area for a few days to a week after the rash has gone to stop it from coming back. Other topical antifungals include miconazole (e.g. Daktarin Cream/Spray Powder, Eulactol Antifungal Spray Liquid), clotrimazole (e.g. Canesten Clotrimazole Cream/Solution, Clonea Cream), econazole (e.g.Pevaryl Foaming Solution), ketoconazole (e.g. DaktaGOLD Cream, Nizoral Cream) and tolnaftate (e.g. Tinaderm Liquid or Powder Spray). Side effects of topical antifungals can include skin redness, itching or stinging at the site of application. If the topical antifungal treatments have not successfully treated your ringworm, or your ringworm affects a large area of skin, your doctor may prescribe antifungal medicines that you take by mouth. Tinea of the scalp and nails also need to be treated with oral medicines, and longer treatment is often needed. itraconazole capsules (e.g. Itracap, Sporanox). The length of time you need to take the medicine will depend on which medicine is prescribed for you - it can vary from 2 to 12 weeks. Side effects of oral antifungal medicines will depend on which medicine is prescribed, but may include liver problems, rash, gastrointestinal upset, headaches and tiredness. See your doctor if the ringworm is not getting better with treatment, or returns soon after treatment finishes. If your ringworm is proving difficult to treat, your doctor may refer you to a dermatologist (skin specialist). What will happen if ringworm is not treated? If you don’t treat the infection, it can spread to involve more skin and to other areas of the body, including the nails and scalp, which tend to be more difficult to treat. You may also pass the infection on to other people if you don’t treat it. Skin cracks or blisters may develop when ringworm is not properly treated. This increases your risk of getting a secondary bacterial infection, which may need treatment with antibiotics. There are several ways you can help stop the spread of ringworm. Make sure you wash all towels and linen in hot water when someone in the household has ringworm. Shower every day and always after exercising. Always dry your skin thoroughly after showering or swimming. Wear clothes that allow your skin to ‘breathe’ - loose-fitting clothes made of material that allows moisture to evaporate, rather than trapping in the moisture. Don’t share towels, brushes, hats, etc. If you have athlete’s foot, use a separate towel for your feet and wash your hands after touching your feet to avoid spreading the infection to other areas of skin. Children with ringworm should not attend school or child care until the day after treatment has started, to prevent the spread of infection to others. Cover the affected areas with clothes or a dressing to stop it spreading to others. 1. Infected skin: Tinea (published Nov 2015). In: eTG complete. Melbourne: Therapeutic Guidelines Limited; 2019 Jan. http://online.tg.org.au/complete/ (accessed Mar 2019). 2. Royal Children’s Hospital Melbourne. Ringworm (reviewed Mar 2018). 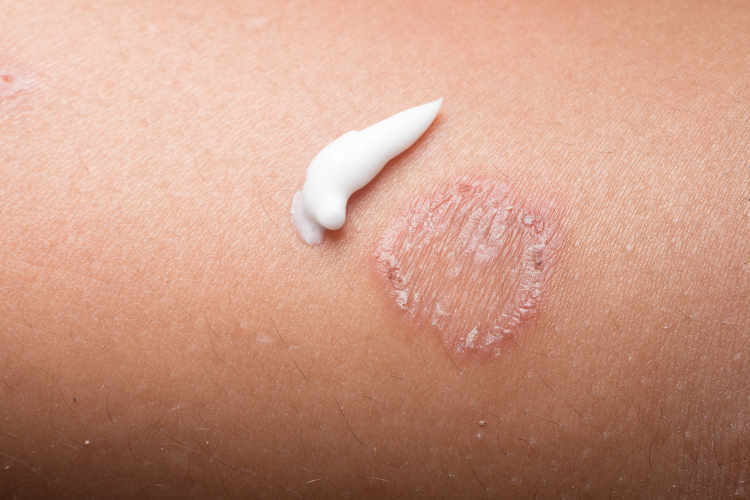 https://www.rch.org.au/kidsinfo/fact_sheets/ringworm/ (accessed Mar 2019). 3. Centers for Disease Control and Prevention (CDC). Ringworm (reviewed 6 Aug 2018) https://www.cdc.gov/fungal/diseases/ringworm/index.html (accessed Mar 2019). 4. BMJ Best Practice. Dermatophyte infections (updated Mar 2018). https://bestpractice.bmj.com/ (accessed Mar 2019). 5. Australian Government; National Health and Medical Research Council (NHMRC). Staying healthy: preventing infectious diseases in early childhood education and care services, 5th Edition 2012 (updated June 2013). https://www.nhmrc.gov.au/guidelines-publications/ch55 (accessed Mar 2019).